What do you suppose the most requested photo from the U.S. National Archives might be? Troops raising the American flag on Iwo Jima? That sailor kissing a random woman at the end of WWII? Nope. 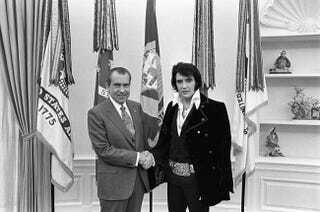 It's Richard Nixon shaking Elvis Presley's hand. The meeting took place in the Oval Office on December 21, 1970 and the photo itself is pretty surreal. But the official meeting notes are somehow even more bizarre. Elvis comes across as more like a strange child showing off his collection of police badges than a rock star meeting with the president of the United States. Elvis even takes some digs at the Beatles for being a "force for anti-American spirit." You really have to read the notes from the meeting below to understand just how strange it must've been to be in that room. The meeting opened with pictures taken of the President and Elvis Presley. The President mentioned that he thought Presley could reach young people, and that it was important for Presley to retain his credibility. Presley responded that be did his thing by "just singing." He said that he could not get to the kids if he made a speech on the stage, that he had to reach them in his own way. The President nodded in agreement. Presley indicated to the President in a very emotional manner that he was "on your side." Presley kept repeating that he wanted to be helpful, that he wanted to restore some respect for the flag which was being lost. He mentioned that he was just a poor boy from Tennessee who had gotten a lot from his country, which in some way he wanted to repay. He also mentioned that he is studying Communist brainwashing and the drug culture for over ten years. He mentioned that he knew a lot about this and was accepted by the hippies. He said he could go right into a group of young people or hippies and be accepted which he felt could be helpful to him in his drug drive. The President indicated again his concern that Presley retain his credibility. At the conclusion of the meeting, Presley again told the President how much he supported him, and then, in a surprising, spontaneous gesture, put his left arm around the President and hugged him. In going out, Presley asked the President if he would see his two associates. The President agreed and they came over and shook hands with the President briefly. At this meeting, the President thanked them for their efforts and again mentioned his concern for Presley's credibility. A man who was known to be abusing drugs was railing on drugs, talked about fears of brainwashing, and then left with an awkward hug? Sounds about right to me.